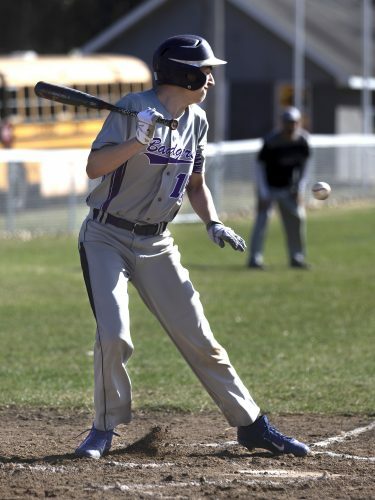 NORWAY — Non-conference games are usually the time for high school baseball teams to experiment with lineup, pitching and batting order changes. Norway and Niagara took full advantage of experimenting in a non-conference doubleheader on Saturday at Marion Park. The Knights took the first game 3-2 and the second game 6-5. In the first game, the teams fielded their usual defensive lineup, batting order and pitching rotation. In the second game, both coaches turned over usual bench players. Niagara coach Dean Neveau said getting usual bench players to start and play throughout a game has multiple benefits. 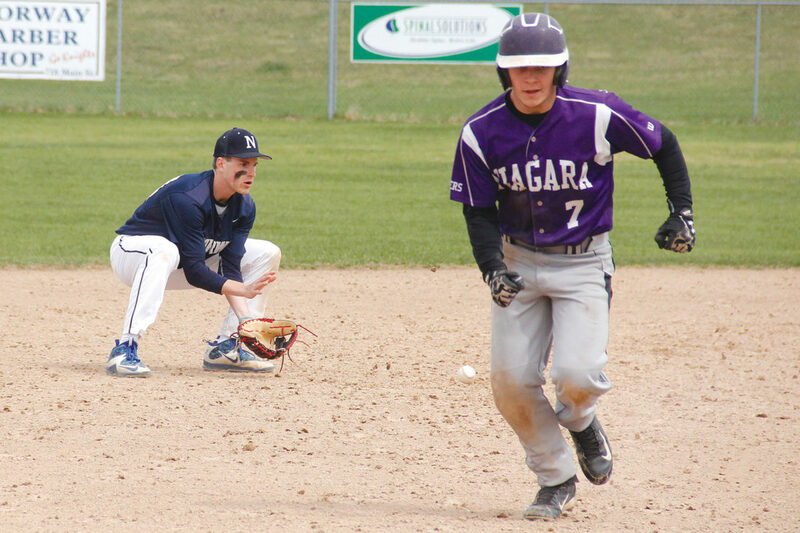 Niagara took a 5-0 lead after adding three runs in the second inning of the second game. The Badgers had started their usual starters, but substituted for the bench starting in the third inning. 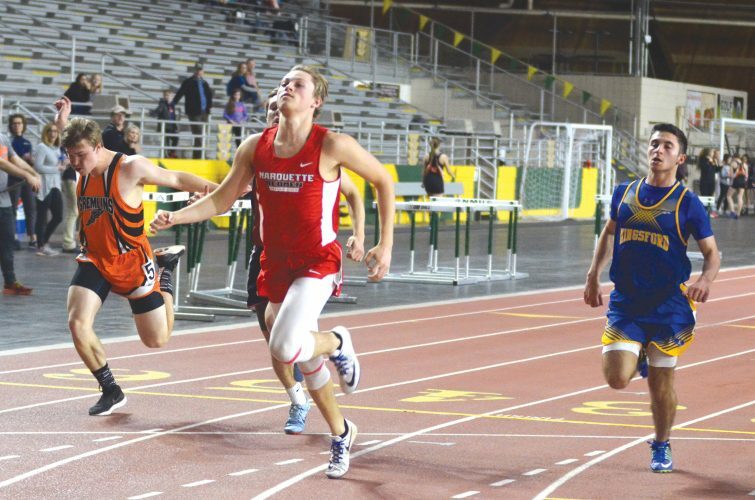 That’s when Norway staged a comeback, scoring four in the third and tying the game in the fourth when Payton Thompson’s single scored Isaac Ray. The Knights threatened to take the lead when the bases were loaded with two outs but a flyout ended the threat. The Badgers threatened in the top of the fifth, putting runners on second and third with one out. The threat ended when Norway first baseman Adam Faull gathered a chopper and stepped on first to end the inning. Norway loaded the bases in the bottom of the fifth before Niagara escaped by tagging out a runner for the third out of the inning. The Knights finally broke the stalemate with a walk-off bases loaded walk. Cody Hendricks started on the mound for Norway and pitched three innings. He gave up five runs on seven hits with no walks and three strikeouts. Thompson pitched three innings in relief, giving up no hits with three walks and five strikeouts. Jacob Bousley started for Niagara. He threw two innings and gave up one hit and struck out three. Tristin DeJardin pitched 1 1/3 innings, giving up five runs (two earned) on five hits with two walks and a strikeout. Dylan Lantagne pitched an inning and gave up a hit and four walks. Charlie Schaeffer pitched the last inning and gave up a run on three walks and a strikeout. In the first game, Niagara took a short-lived 1-0 lead in the third inning when Landen Kaldor scored. The Knights responded in the next half-inning when Micah Wilson scored on a groundout by Justin Bal. Norway took the lead with two runs in the fifth. Wilson scored on a throwing errors and Kevin Evosevich scored on a single by Dane Vandenheuvel. Lantagne scored on a two-out single by Dylan Neuens in the sixth. Neuens, the tying run, was stranded at second on a groundout to end the game. Doda started for Norway and threw five innings, giving up a run on two hits with a walk and five strikeouts. Wilson pitched an inning in relief, giving up a run on one hit. Ethan Blagec started for the Badgers and pitched 2 2/3 innings, giving up a run on three hits, a walk and a strikeout. Bousley pitched the final 2 1/3 innings, surrendering two runs on two hits with two strikeouts. Neveau said he had to be careful with pitch counts as the Badgers face Gillett-Suring today. His pitchers had also thrown a lot in the previous week. “We’re kind of hurting for pitching today because everybody’s been thrown out through the week,” he said. Norway plays at Bark River-Harris on Tuesday.